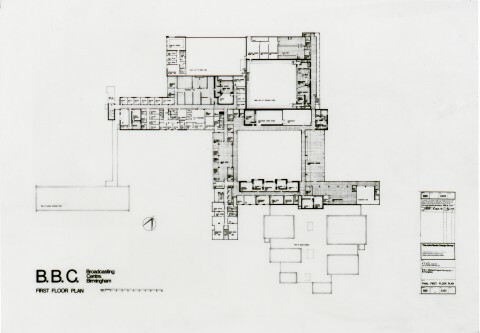 Negative, First Floor Plan, 1971. This digital resource is available under a Creative Commons CC-BY-SA 3.0 license, with kind permission of the Birmingham & Five Counties Architectural Association Trust, thanks to the Architectus project (part of the Jisc Content Programme 2011-13). This plan of the first floor of Pebble Mill is from the building architect, John Madin’s office. It shows the upper part of Studio A, and the Scene Dock, as well as the News Studio.